There's only one thing worse than never becoming a billionaire, and that's becoming a billionaire and then unceremoniously losing your billionaire status. That's the fate that seems to be creeping up on Australian billionaire Andrew Forrest (for now), who's coming closer and closer to seeing his net worth dip below that crucial $1 billion margin. This isn't some hairline fluctuation, either. Four years back, Forrest had a net worth of almost $7 billion, which made him the second richest person in Australia. Now, his net worth has plunged more than 81% compared to what it was at its highest – you know you're rich when you can lose 81% of your net worth and still be rich, but this still can't feel good for Forrest or anybody whose fortunes are tied to his. There are two main factors involved in Forrest's ongoing fall from financial grace. The first is the price of iron ore, which happens to be the only product mined by his Fortescue Metals Group. That price has been dropping steadily for years, and analysts don't expect that trend to stop – which is bad news for Forrest given how specialized his business is in iron ore. That's not his only problem, though, since he and his accountants also have to contend with the Australian dollar's weakness compared to the American dollar in recent years. 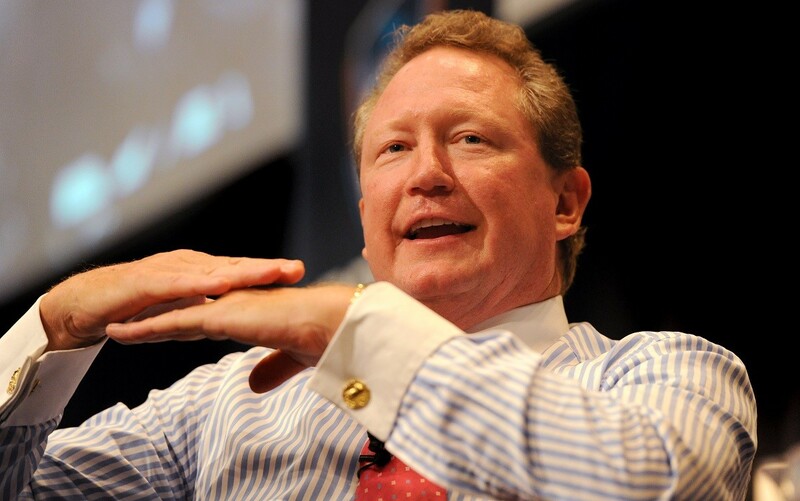 Back in 2011, Forrest's billion shares in the Fortescue Metals Group were valued at $6.90 per share, making his net worth at the time a relatively simple calculation. Then, a ton of iron ore was priced at around $130, and Forrest's Australian dollars were roughly equal in value to ones found across the ocean in the United States. But now, the average price for a ton of iron ore has fallen to just $55, and a dollar in Australia is worth just 75 cents in the US, and these two financial dips are like a perfect storm in Andrew Forrest's bank account. Right now, a share of the Fortescue Metals Group will set you back just $1.28, which, when multiplied across Forrest's billion shares in the company comes to about $1.2 billion. You don't have to be an economist or a mathematician to figure out that if that stock keeps dropping enough to get below a dollar a share, Forrest will have to clean out his locker at the Billionaire's Club and find another place to sleep off hangovers. Luckily for Forrest, he is reported to have a few holdings outside of his billion shares in Fortescue. He also has interests in farms of both the dairy and cattle variety, as well as nickel and uranium. But it's the company he founded, Fortescue Metals, that makes up the bulk of his fortune – so it might be time for him to start looking into other metals.